Trying to find a new job can be challenging for anyone. It’s even harder if you’re over 50. The unemployment rate for older workers is lower than it is for younger people. Even still, once out of a job, workers over 50 experience greater difficulty trying to find a new job. Here are some tips to keep in mind if you’re over 50 and trying to find a new job. A resume is one of the first things a potential employer will see before deciding whether or not you should be called in for an interview. Don’t overlook this important document! Don’t include every job you’ve ever had on your resume. It will call attention to your age if you list too many past positions. Instead, you should highlight your most recent and relevant experience. If it has been awhile since you attempted to find a new job, ask a younger friend in your network to take a look at your resume. Ask if there are any new resume trends you can incorporate. One way to use your age to your advantage is to spin the view of your age into years of experience. Next, make your age an asset. Tell your prospective employer how you have gained an extensive knowledge of the industry and its competitors in all the years you have worked in the field. This is something that younger candidates won’t have in their corner. Another positive factor to highlight is your mature work ethic. Showcase that you value following through on tasks. Demonstrate that you understand the value of responsibility and timeliness. Employers will appreciate the possibility of gaining a reliable employee. A common stereotype is that those in the “over 50” category will have outdated skills in technology. You don’t want this to be the reason you get eliminated from the pool of candidates. Some things you can do to stay up to date is to ask people in your network for coaching on the systems required in your field. You can take classes online, or ask to shadow a colleague. Don’t wait until you are trying to find a new job to try to learn everything in a short period of time. Do your best to keep brushing up your skills as you go along in your career. There is always something to learn and improve upon. If you can no longer accomplish the physical tasks required of your position, think about your industry structure. Consider whether or not you could take on a more supervisorial role in the same field. Taking a leadership course could help you get started on this path if it is something of interest to you. Another option is to teach your trade. Training others could be a fulfilling career you might enjoy. A recruiter will take the time to get to know you and your unique situation. They can help you find a job because they have built long-lasting relationships with companies and get a first look at the newest openings. They will be your advocate and help match you with a company that fits you and your skills. Not sure where to start? Contact a recruiter today to find out more. While it can be difficult to find employment when you are over 50, focus on your skills and stay positive! 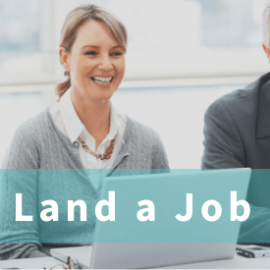 If you do that and keep the above tips in mind, you will have a better chance of overcoming the stumbling blocks of a job hunt and find a new job in no time.